JUSTICE Lawyers Chikere of the Federal Court of Justice in Abuja has ordered on Tuesday that the former Governor of the Edo State, Comrade Adams Oshiomhole, with an application by the anti-corruption crusader Bishop Osadolor Ochei to be brought to justice Commission for Economic and Financial Crime (EFCC) on the arrest and prosecution of Oshiomhole for alleged financial fraud. The judge, who also ordered the anti-graft agency to be served with the lawsuit, said the service was done within five days of 9 October 2018 when the order was made. The lawyer of Bishop Ochei, dr. West Idahosa, while filing a motion in suit no. FHC / ABJ / CS / 628/2018, requested the court to give an answer to Oshiomhole and the EFCC, which are the Respondents, the weighty allegations made by the Applicant in support of the anti-corruption struggle of the Federal Government has raised against them. The Exparte application followed Bishop Ochei's petition to the EFCC on October 28, 2016 against Oshiomhole, who was Governor of the Edo State from November 2008 to November 11, 2016. Dr. Idahosa told the court to comply with his client's request, giving the court 86 copies of exhibits in support of the motion, adding that there are documents and electronic images of former governor's palaces whose income is beyond his lifetime and that, there is evidence of how Oshiomhole allegedly diverted money for Edo state project to personal projects. The counsel added that the former governor has vouchers exorbitant fares, stressing that the level of fares is sufficient to buy an airline for Edo statesmen. He said there was evidence of how the ex-governor used a huge amount of state money to repair his private vehicles and asked the court to grant his client relief. EFCC has committed fewer crimes and prosecuted Why should the anti-graft agency ignore the petition? Justice Chikere was adjourned on October 23, 2018 for arguments by all parties involved. Bishop Ochei, in the request, wants the court to declare that the anti-graft agency has a legal duty to investigate and prosecute the former governor, on his allegations against him in accordance with the law to establish the commission. The allegations address the diversion of the Edo Sovereign Fund by the former governor, who is now the national chairman of the All Progressives Congress (APC), for his personal use. In a personal affidavit the complainant had made in person, he claimed that corruption had become a social disease that had penetrated deeply into society, and that the EFCC must take complaints against corrupt practices seriously. 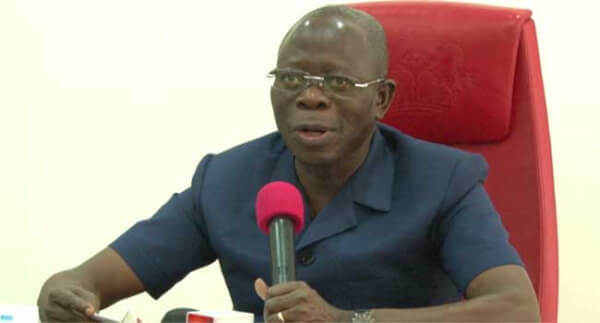 He said he complained several times to the EFCC that allegations of corruption had been brought against Oshiomhole without any reaction or interest from the Commission. According to him, on May 4, 2012, Matthew Edaghese sent a petition to the EFCC complaining that Oshiomhole, while serving as governor, had built mansions on a vast land area valued at more than $ 10 billion Governor. "The EFCC has not objected to the petition," Bishop Ochei said, adding that in 2016 he petitioned Oshiomholes for corrupt practices without any action from the EFCC. He accused the former governor of corrupting himself with the funds of the Edo state government.